You know who I don’t want to meet in a fight? A Le Mans prototype driver. 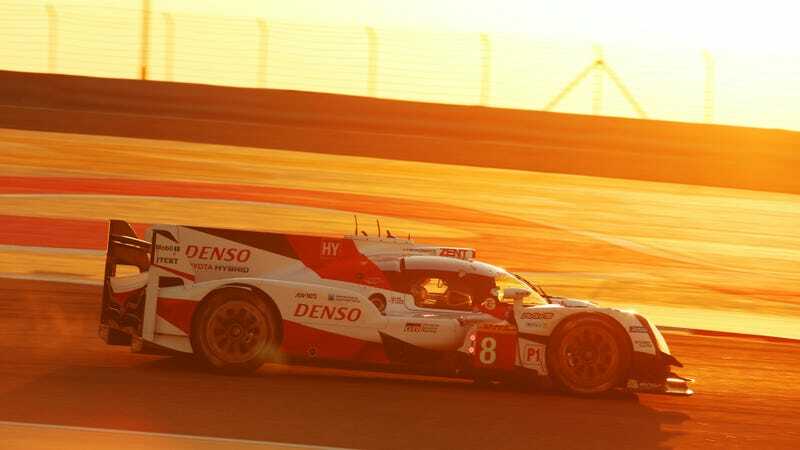 Between the 6 Hours of Bahrain’s overall winner Anthony Davidson driving with a broken toe and LMP2 class winner Bruno Senna driving with no power steering for most of the last hour, those guys are all tougher than I will ever be. The LMP1 championships was already decided, but Porsche wanted so hard to get one last win before they retired their 919 and left the LMP1 class. That was deeeeeee-nied, as contact with a LM GTE Am-class Porsche and the subsequent stop and go penalty they had to serve as a result forced their leading No. 1 car to a second place result. Toyota’s No. 8 car cruised home to a win as the only LMP1 car not to have major, pit stop time-sucking contact with either a bollard or a GT-class Porsche 911. It wasn’t an easy win for one of its drivers, though. No. 8 driver Anthony Davidson broke his toe after stubbing it on the way to the car, but drove anyway, because I mean, that’s endurance racing. Will the given malady, whoopsie or item of discomfort break the car, kill you or otherwise cause the car to lose? No? Then you keep running. LMP2, however, proved why Bruno Senna is a beast of a man. He immediately slowed down three seconds per lap when his No. 31 Vaillante Rebellion’s steering failed but managed to keep their lead until the very end of the race. Senna came home only 10.6 seconds ahead of Jackie Chan DC Racing’s Oliver Jarvis, but that was enough to win. This was enough to earn Senna’s team the hotly contested LMP2 teams’ championship—a championship so close that only three points separated the No. 31 from Jackie Chan DC Racing going into this race. Bruno Senna and teammate Julien Canal won the LMP2 drivers’ championship. AF Corse Ferraris took home first and second place in LM GTE Pro, with the No. 51 of Davide Rigon and Sam Bird taking home the win, and the No. 51 of Alessandro Pier Guidi and James Calado winning both the LM GTE Pro teams’ championship as well as the LM GTE Pro drivers’ championship. Andy Priaulx in the No. 67 Ford GT made an excellent pass with only 11 minutes to go to sneak third place in the LM GTE Pro class away from the No. 91 Porsche 911 RSR. Back in pit lane, race winner Sam Bird stole all the attention back when he proposed to his girlfriend. She said yes. In LM GTE Am, the dominant No. 98 Aston Martin Racing car got the race win and the championship it clearly deserved. The No. 98 seemed almost untouchable for most of the race. The No 98 won the LM GTE Am teams’ championship and drivers Pedro Lamy, Mathias Lauda, and Paul Dalla Lana took home the drivers’ title for the class. This brings an end not just to the WEC season, but the end of WEC as we know it. The next two years will be spent in a transitional season as the series reworks its calendar to end with its flagship race, the 24 Hours of Le Mans. Likewise, its top LMP1 class is undergoing a complete re-think after Porsche announced their departure. Costs had spiraled out of control, and priority number one is reworking the class to become attractive to manufacturers again. LMP1 has long been a racing fan’s favorite class because of the insane engineering feats that came out of having few restrictions in the way. It’s hard not to be sad, not only at losing Porsche’s top-class prototype team, but at losing LMP1 as a whole as a result. 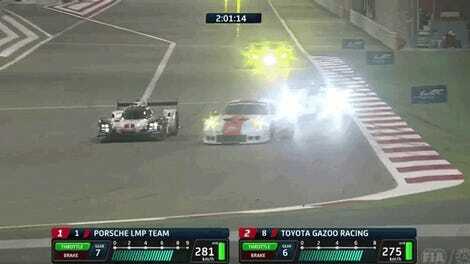 We’re still hopeful about the future of WEC’s LMP1 class, though. Give race engineers some rules and restrictions, and we’re certain they’ll figure out a clever way around them.